Tapas is the name of a wide variety of appetizers, or snacks, in Spanish cuisine. They may be cold (such as mixed olives and cheese) or warm (such as puntillitas, which are battered, fried baby squid). 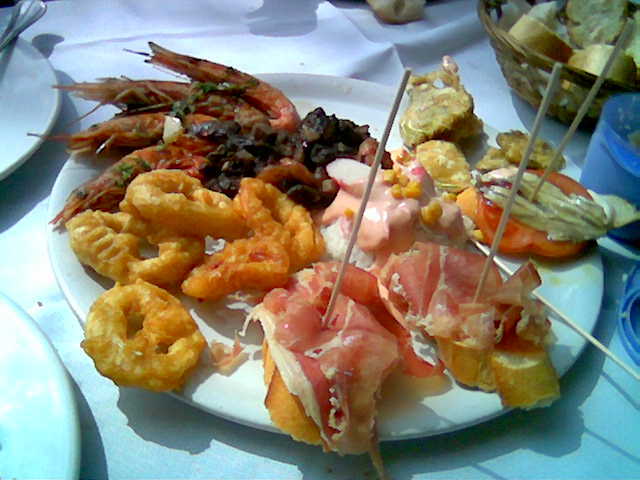 Left: Tapas, featuring fried squid, shrimps, and jamon. The word “tapas” is derived from the Spanish verb tapar, “to cover”. The original tapas were the slices of bread or meat which sherry drinkers in Andalusian taverns used to cover their glasses between sips. This was a practical measure meant to prevent fruit flies from hovering over the sweet sherry. Left: Tapas accompanied by Sherry. The meat used to cover the sherry was normally ham or chorizo, which are both very salty and activate thirst. 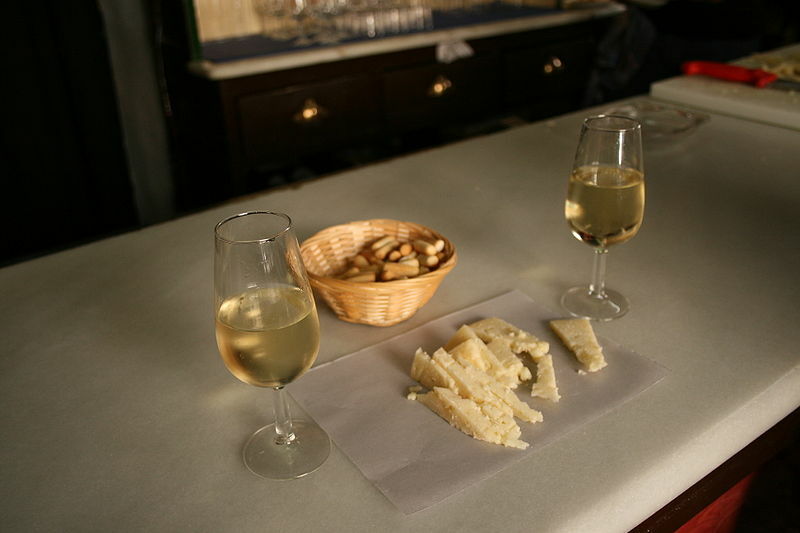 Because of this, bartenders and restaurant owners began creating a variety of snacks to serve with sherry, thus increasing their alcohol sales. The tapas eventually became as important as the sherry. In Spain, dinner is usually served between 9 p.m. and 11 p.m. (sometimes as late as 12 midnight), leaving significant time between work and dinner. Therefore, Spaniards often eat tapas in the time between finishing work and having dinner. Since lunch is usually served between 1 and 3 p.m., another common time for tapas is weekend days around noon as a means of socializing before lunch proper at home. It is very common for a bar or a small local restaurant to have 8 to 12 different kinds of tapas in warming trays with glass partitions covering the food. They are often very strongly flavored with garlic, chilies or paprika, cumin, salt, pepper, saffron and sometimes in plentiful amounts of olive oil. Often one or more of the choices is seafood (mariscos), often including anchovies, sardines or mackerel in olive oil, squid or others in a tomato based sauce, sometimes with the addition of red or green peppers or other seasoning. It is rare to see a tapas selection not include one or more types of olives, such as manzanilla or arbequina olives. One or more types of bread are usually available to eat with any of the sauce-based tapas. Allioli Means "Garlic and oil" in Catalan. The classic ingredients are only garlic, oil and salt, but the common form of it includes Mayonnaise and garlic. A very strong garlic paste. Served on bread or with potatoes, fish, meat or grilled vegetables. Bacalao Salted cod loin served very thinly usually served with bread and tomatoes. Chorizo al vino Chorizo sausage slowly cooked in wine. Chorizo a la sidra Chorizo sausage slowly cooked in cider. Croquetas A common sight on bar counters and in homes across Spain, served as a tapa, a light lunch, or a dinner along with a salad. Empanadas or empanadillas Large or small turnovers filled with meats and vegetables. Ensaladilla rusa This literally means "(little) Russian salad" and is made with mixed boiled vegetables with tuna, olives and mayonnaise. Patatas bravas Fried potato dices (sometimes par-boiled and then fried, or simply boiled) served with salsa brava, a spicy tomato sauce. Alioli is often served with it too. Tortilla de patatas, also known as Tortilla española A type of omelet containing fried chunks of potatoes and sometimes onion. A variety containing vegetables and chorizo is known as Tortilla paisana.